Activation of potassium channels regulates excitability and can control the shape of the action potential waveform. They are present in all cells within the body and can influence processes as diverse as cognition, muscle contraction and hormone secretion. Potassium channels are subdivided into families, based on their structural and functional properties. The largest family consists of potassium channels that activated by membrane depolarization, with other families consisting of channels that are either activated by a rise of intracellular calcium ions or are constitutively active. 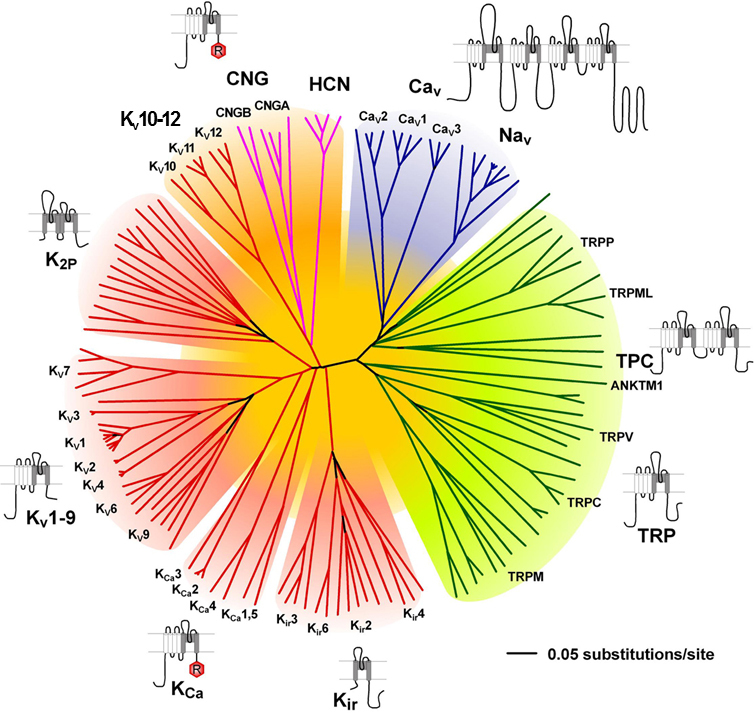 A standardised nomenclature for potassium channels has been proposed by the NC-IUPHAR subcommittees on potassium channels [1-4], which has placed cloned channels into groups based on gene family and structure of channels that exhibit 6, 4 or 2 transmembrane domains (TM). Potassium channels. Accessed on 19/04/2019. IUPHAR/BPS Guide to PHARMACOLOGY, http://www.guidetopharmacology.org/GRAC/FamilyDisplayForward?familyId=133. Alexander SPH, Striessnig J, Kelly E, Marrion NV, Peters JA, Faccenda E, Harding SD, Pawson AJ, Sharman JL, Southan C, Davies JA; CGTP Collaborators. (2017) The Concise Guide to PHARMACOLOGY 2017/18: Voltage-gated ion channels. Br J Pharmacol. 174 Suppl 1: S160-S194.